Really, Muni operator? Manicure on the bus? My friend and I were riding the 33 to our local friendly Comcast (sarcasm) and we witnessed an off duty muni driver clipping his fingernails in the back. He didn’t even bother to collect the freshly shorn nails off the floor! Can we get a “ewwww”? We all know that people who ride Muni should not resort to manicures on public transit. But now operators are doing it, too? As Charlie Brown would say: Good grief! It’s gross and all, but that title is not doing MUNI any favors. How ’bout you take your shoes off the seat before you get too holier-than-thou about other folks’ filthy habits? I clicked on this to post the same thing. That guy was probably trying to shoot fingernails into the photographer’s shoe. That said, I was riding the J (or was it the K?) after school one day, and I saw a Muni driver spitting into the area by the door (with the moving stairs). Actually, I was far enough away not to be sure until the bus got crowded and I stood up and moved over. He’d left by that point. Ick. Yeah, not cool. Clipping nails is not a public activity. Also, notice the driver is taking up two seats…I’m just saying. Sets a bad example. We Manner Ladies fully agree with all the comments posted here, as we see a disturbing range of transit etiquette infractions in play, from nail clipping to seat overflow to feet on seats. Tsk, tsk! Bravo to the Muni Diaries crew for exposing this behavior. A little shame can go a long way, no? Carry on! Thanks for changing the title. There are a lot of drivers and a lot of buses/etc on the road that aren’t getting in accidents. We need to support MUNI, not knock it. No worries. You guys do a great job. I didn’t mean for it to sound condescending. But re-reading it, it kinda does. My apologies. The sound of clipping nails on a bus or train is totally annoying. I was riding the bus yesterday and after 10 blocks, turned around at the lady and told her to stop clipping nails. I told her again, using my hands to simulate what she was doing, and said it again, do it OFF THE BUS. 20 seconds later, she keeps on clipping her nails. None of the other passengers said a word to the lady and I had the guts to get in her face. I saw a lady this morning on an empty 27 on my way downtown today, she was doing a manicure, and I can’t believe she didn’t bother to stop after I tried to get a picture of her today, which I ended up doing, but from a different angle. 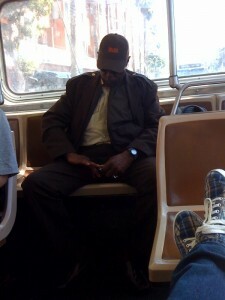 Ive seen this same exact muni driver doing the same exact thing on a 47 months ago. Was disgusted then too.